Hutton Roof Crags is denoted a Site of Special Scientific Interest by English Nature. The area, approximately 100 hectares is also very close to the Farleton Knott SSSI. This area holds nationally significant limestone pavement and is rich in rare flora and fauna. Read the Citation from English Nature for full details. In or beside the SSSI is Hutton Roof Crags and Park Wood National Nature Reserve which are managed by Cumbria Wildlife Trust. There is also Holme Park Fell, belonging to the National Trust (managed as part of the Trust's Arnside & Silverdale property, but actually it is 4 miles further East), Holme Park Quarry Local Nature Reserve and Clawthorpe Fell National Nature Reserve. There is a useful leaflet "Limestone Landscapes" covering the whole area. A comprehensive list of all species of flora and fauna found in this areas is held on the wildlife by parish database. See what you should be looking out for, and update their records if you get lucky. One of the landmarks in the parish is this massive block of limestone called Hanging Scar which can be found by the path leading up the Crag, near Cragside. It is described by Wainwright in his book Westmorland Heritage. 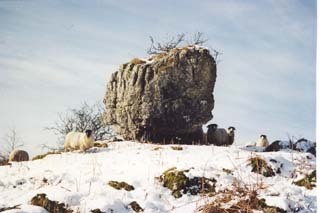 "This is a splendid example of a 'perched' limestone boulder and it is the biggist of its kind in the county"
Some sources incorrectly call this rock the Cuckoo Rocking Chair, which is actually a smaller rock further up the crag, on the fringes of the limestone pavement.